Starchy foods are always considered to be the enemies of our health, and most of them are avoided by people who plan to lose weight and who are on a diet – but is it really so? Today it is a common knowledge that there are healthy carbohydrates found in plant foods - cereals, potatoes, beans and vegetables, as well as products such as bread and pasta. How to choose the right foods that do not cause weight gain and allow easy digestion find out below. Which foods are rich in starch? It has long been thought that foods rich in starch, cause weight increase and today are avoided by people who have a problem with overweight, we'll be gentle and say that those people are not sufficiently informed. However, you might be surprised by the fact that starchy foods from which we are running away, are the true superstars in the galaxy food industry. Today, everybody who is involved in healthy eating is clear that the road to better health is paved just by food containing starch, namely potatoes, pasta, cereals, beans. It is a big mistake for starchy foods to be replaced with protein, as in this case, put into the body too much animal food, which are rich in unhealthy fats and in many ways adversely affect human health. What one needs is a quality fuel that is healthy carbohydrates, highest quality body petrol, which allows the body to properly function. Starchy foods are the ones that give us the energy we need, prevent the serious decline in immunity, which is very common during colder days. We often mention starchy foods, mostly in a negative way, because we thing they are to blame for our weight gain problem. However, not all carbohydrates in foods are bad and therefore it is very important to be properly informed, so that we can achieve good health and optimum body weight and in the end be happy with ourselves. Carbohydrates are sugars and starch in the food we consume. Often we do not understand the relationship between sugar and starch, and even more of us confuse the terms with simple and complex carbohydrates. So let's see what this is about! Sugars are simple, and the starch is a kind of complex carbohydrate. All of them are degraded in the digestive tract, and formed as an end product is glucose. Blood glucose is absorbed from the intestine, and delivered to our cells, which is then used as an energy source. 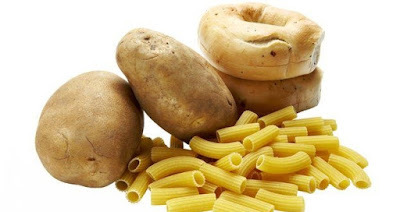 Starchy foods or so called complex carbohydrates are found almost exclusively in plant foods - cereals, potatoes, beans and vegetables, as well as products from them, including pasta and bread. Simple carbohydrates (sugars) are very quickly digested, enter the bloodstream very quickly, leading to a rapid increase in blood sugar and, consequently, the rapid increase of energy, easily this at first it works very well, it is a trick that makes us eat more and more, because shortly after that jump of energy a strong counter-reaction of the pancreas occurs, which then emits a large stream of insulin into the bloodstream. This hormone not only restores blood sugar to normal than it often drops it too low, which leads to a drop in energy, then trembling and dizziness occurs, which is why we often reach for a new dose of sugar. Is there a better solution for this situation? Of course there is. For example, when our sugar levels drop instead of chocolate, eat a homemade apple, which is also a good source of carbohydrates, and vegetable fiber, which slows the absorption of sugar in the blood circulation, improves digestion and help weight loss. Even better solution is to consume starchy foods for example foods rich in complex carbohydrates, which are very useful for health. What are these starchy foods which do not cause weight gain? Many of us are wondering what foods cause weight gain and whether they are included in starchy foods. What definitely causes weight gain are fats, not carbohydrates in the diet, as is commonly thought. One gram of fat contains nine calories, while the same amount of carbohydrates has just four. Of course, this refers to complex carbohydrates. However, what today is a major problem are refined carbohydrates, which contain too many calories and which are most responsible for the extra weight, they are most certainly most accessible ones. Also, the problem is how we prepare foods. For example, there is a big misconception in relation to potatoes, the king of starch. Many who want to lose weight avoid these vegetables, but the problem is in a way they are prepared. The fruit weight of 140 grams has only 80 calories, but the problem arises when we fry them in deep oil (chips), when they are baked on grease from the meat, egg toppings, cream and milk, or are eaten with sauce of ketchup, mayonnaise, sour cream, cheese. But if you cook and combine it with lentils or other legumes and vegetables, you will get the perfect meal - because this is what starchy foods certainly are. How to properly combine starchy food? Since we found that starch in the diet is not harmful it is more a case of proper combining of foods. The process of digestion of starch begins in the mouth, and, if the starch has well soaked with saliva, the process continues in the stomach for about two hours, unless the process is not disrupted due to incorrect combining of foods. In other words, if you along with starchy foods you eat foods that require increased secretion of gastric acid (meat, eggs, fish ...) the process of decomposition of starch is interrupted, leading to poor digestion, fermentation of food and various digestive problems such as bloating stomach , gas and constipation. So, one of the basic rules of combining ingredients is as follows: starch and proteins should not be mixed in one meal. When we say proteins, we primarily refer to proteins of animal origin. On the other hand, legumes are an excellent source of protein, it is an excellent starchy vegetable and combine them with potatoes and whole grains is extremely recommended. You should avoid combining different types of carbohydrates, so it is not advisable to eat bread and potatoes or cereals and bread – in this way starchy foods are not useful because we can needlessly overload the organism with different carbohydrates. Yes, and it is possible, starchy diet is nothing new. This dietary regimen is completely opposite to the famous Atkins diet, and includes complex carbohydrates and “good" starch, which is not only grown but encourages weight loss. Foods rich in starch and that this "good" are bananas, beans and potatoes, and they are also called "resilient" because to some extent they resist digestion and pass through the digestive tract almost intact. During this process starch produces fatty acids, which stimulate the production of enzymes that melt the fat deposits, especially those in the stomach, and also provides a long-lasting feeling of satiety. Some studies have found that consumption of starch in one meal leads to a reduction in the total number of calories by as much as ten percent during the following day, because the person does not experience hunger pangs. Another study showed that resistant starch in foods increases the activity of enzymes for fat loss and reduces the activity of those who promote the storage of fat. Most people enter about 4.8 grams of starch during the day, but experts recommend that to achieve this effect it is necessary to consume 15 grams. We hope that you find out what the healthy starchy foods are and how they should be combined, we recommend that you find out what are the foods with low glycemic index.